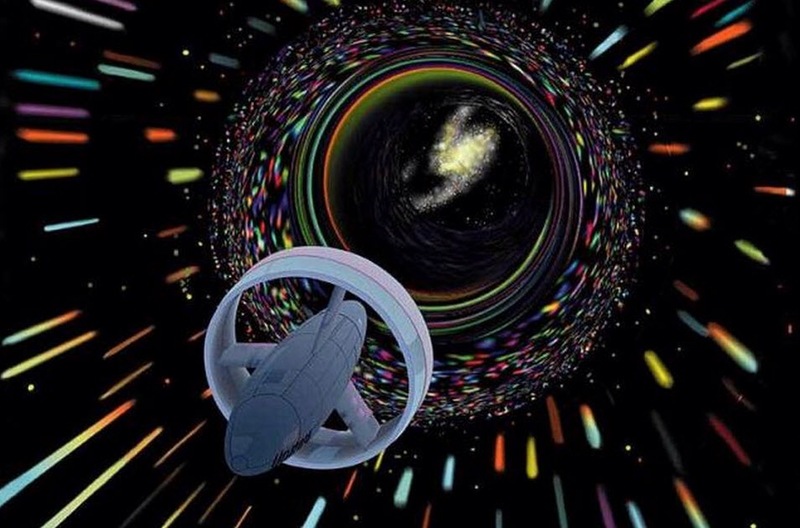 There could be a space-time tunnel (wormhole) in our galaxy, as dramatized by the film Interstellar, that would allow us to travel to a distant location in the galaxy, and the tunnel could even be the size of our entire galaxy. That’s what astrophysicist/dark-matter expert Paolo Salucci of the International School for Advanced Studies (SISSA) and colleagues suggest in a paper published in Annals of Physics (open-access arXiv version here), based on combining the map of the dark matter in the Milky Way with the most recent Big Bang model. Visual interpretations of wormhole transit. The authors note in the paper that “our result is very important because it confirms the possible existence of wormholes in most of the spiral galaxies. Scientists remain silent on whether it is possible to manufacture or create of the exotic matter violating null energy condition in laboratory. As a result the construction of a wormhole geometry in our real world is extremely difficult. So can this be tested experimentally? “In principle, we could test it by comparing two galaxies — our galaxy and another very close one like, for example, the Magellanic Cloud, but we are still very far from any actual possibility of making such a comparison,” he says. The presence of dark matter in the halo is inferred from its gravitational effect on a spiral galaxy’s rotation curve. Without large amounts of mass throughout the (roughly spherical) halo, the rotational velocity of the galaxy would decrease at large distances from the galactic center, just as the orbital speeds of the outer planets decrease with distance from the Sun. However, observations of spiral galaxies, particularly radio observations of line emission from neutral atomic hydrogen (known, in astronomical parlance, as HI), show that the rotation curve of most spiral galaxies flattens out, meaning that rotational velocities do not decrease with distance from the galactic center. The absence of any visible matter to account for these observations implies either that unobserved (“dark”) matter exists or that the theory of motion under gravity (General Relativity) is incorrect. An earlier study (Rahaman, et al., 2014 and Kuhfittig, 2014) has demonstrated the possible existence of wormholes in the outer regions of the galactic halo, based on the Navarro–Frenk–White (NFW) density profile. This paper uses the Universal Rotation Curve (URC) dark matter model to obtain analogous results for the central parts of the halo. This result is an important compliment to the earlier result, thereby confirming the possible existence of wormholes in most of the spiral galaxies.